Medium - £117.99 Only 4 left! Large - £117.99 Only 7 left! X-Large - £117.99 Only 3 left! Direct thy gaze: Here is the that special breed of fellow who can change the course of history and plunge the entire European continent into chaos if he so wishes... or save it from itself. Sort of like Henry VIII. Whatever monarch he reminds you of, he's a man surrounded by a sense of destiny. And so will you be when you arrive at the party in this stunning costume! Your regality will be clear to all who see you, and before you know it, you'll be sparring (hopefully only verbally) with fellow heads of state, negotiating dowries, and strutting around with your retinue... which is medieval for "entourage." 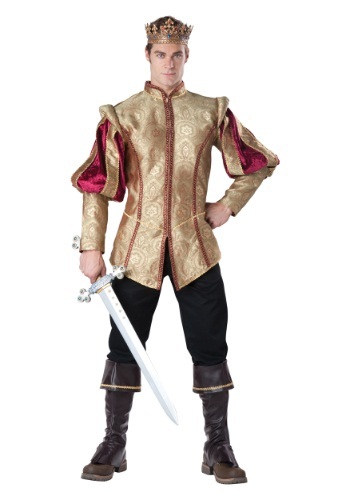 Your presence will be truly royal in the Men's Elite Renaissance Prince Costume! It's the details that truly elevate this outfit to regal status. Its centerpiece, the doublet, is a lush brocade with a rich ornamental pattern, so it's clear this guy's no peasant. And the shoulders are "slashed sleeves," a feature everyone knows when they see it, and one that instantly places the wearer in a distinct place and time. The costume also includes faux leather leg attachments that make you look like a fully booted royal. And let's not forget the crowning feature of the outfit... the crown itself! Made of molded vinyl, it's studded with faux gems that'll give you the look of a wealthy king's heir apparent. The Men's Elite Renaissance Prince Costume is ideal for Halloween parties, any masquerade, and, of course, the renaissance fair. Just don't forget to have a look at our wide selection of royal accessories to outfit this prince with the sword he needs!